She stars as Zoe, an executive at the company Jennifer Lopez works for in the new film, Second Act. And on Sunday, Vanessa Hudgens was in full work mode during a press day to promote the new romantic comedy. The raven-haired beauty suited up in a black romper, that was anything but simple thanks to its dramatic sleeves. The 30-year-old paired her monochrome one-piece with a set of matching ankle boots. Vanessa's shoulder-length hair was parted to one side and styled in beachy waves. The High School Musical star topped off her look with a heavily-winged eye, natural lip and large gold earrings. In her new film, Second Act, Vanessa plays Zoe, the Vice President of Beauty at FNC, the company which ultimately employs Jennifer Lopez's character, Maya. The story follows Maya, a grocery store employee who, because of a lie, gets hired at an upscale New York company. Also starring alongside Vanessa and Jennifer is Leah Remini. The King of Queens star plays Joan, Jennifer's best friend, who coincidentally, is her real-life BFF as well. 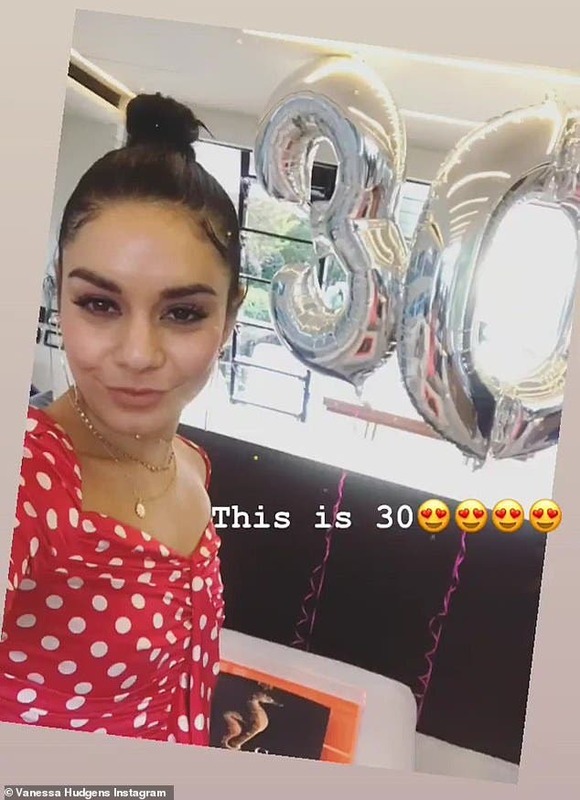 On Friday, Vanessa celebrated her milestone 30th birthday. The star spent her big day on a yacht with boyfriend Austin Butler, whom she met through friend Ashley Tisdale. In an interview with E!, the Salinas, California native detailed their introduction, as well as potential plans of motherhood. When asked if she 'felt pressure' to become a mother, the star said she does not. 'No! I don't want kids for another eight years!' she insisted. 'I'm cool being an older mom. I got way to much to do. I have steps I want to take and I want to be able to enjoy all those moments. I feel like everyone has their own clock and you work on the time that is right for you.